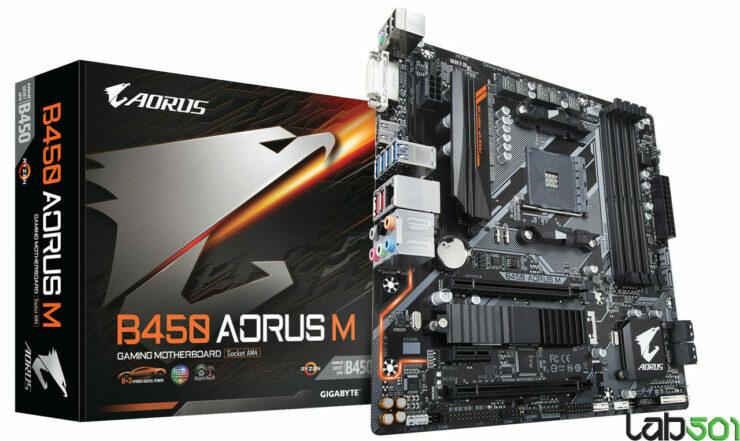 In recent news we have seen Gigabyte ready the release of their newest B450 motherboard lineup for the mid range, these we will hopefully see timed with AMD’s new Ryzen 2300X and 2500X. These include the M-ATX B450 Aorus M and Aorus B450 Pro. 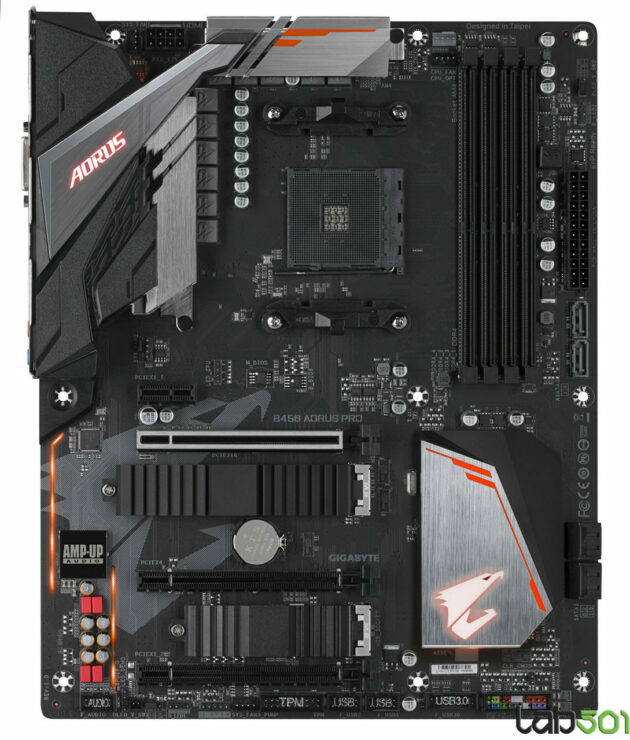 The Aorus B450 Pro packs the features you would expect, from an 11 phase VRM for the SoC with high current chokes, packs 4 DDR4 DIMM slots and a reinforced PCIe 3.0 x16 slot, another x16 slot is only wired for 3.0 x4 and shares lanes with the top M.2 22110 slot. With an M.2 SSD installed, auto-switching gates the second x16 AIC slot. Also it features a third x16 slot wired for gen 2.0 x4 and is wired to the chipset. Finally, it features a single PCIe x1 slot and an M.2 2280 slot is gen 2.0 x4. 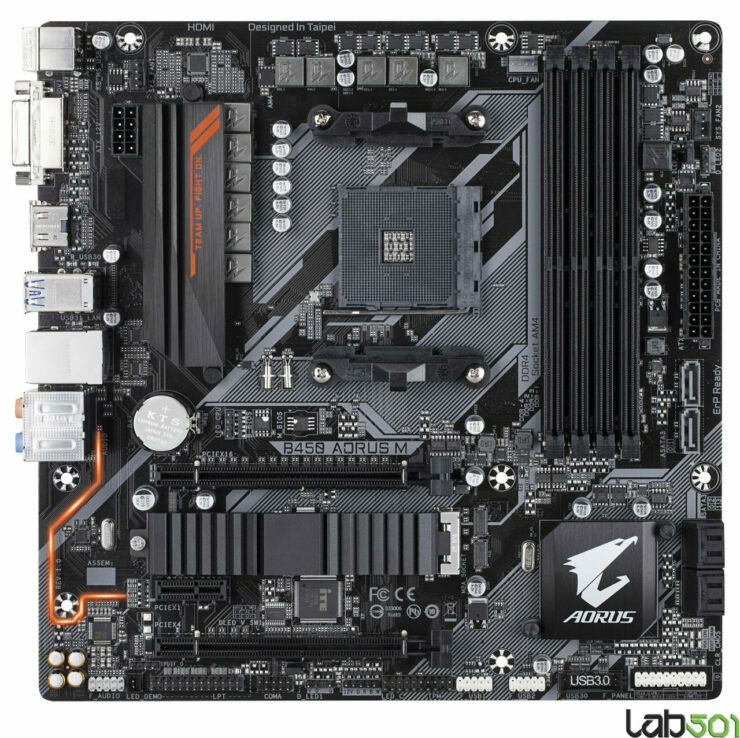 The Aorus pro has six SATA 6Gbps ports, two come from AMD’s SoC the other 4 come from the chipset, and both M.2 slots have heatsinks, moving from the storage and expansion options the board features high end onboard audio using a realtekALC 1220 (120 dBA SNR) codec with EMI shielding with audio class WIMA and Muse capacitors and ground level isolation to remove noisy interference, for USB we have a USB 3.1 gen 2 type A and a USB 3.1 gen 2 type C connectors with four USB 3.1 gen 1 ports on the back and two on the front panel headers. For display we have DVI and HDMI. On the networking side, we have a single one gigabit LAN interface using an unknown controller as well as LED RGBs a key feature in just about every mid to high-end board out today. To round it off we have an integrated I/O shield which is fantastic. 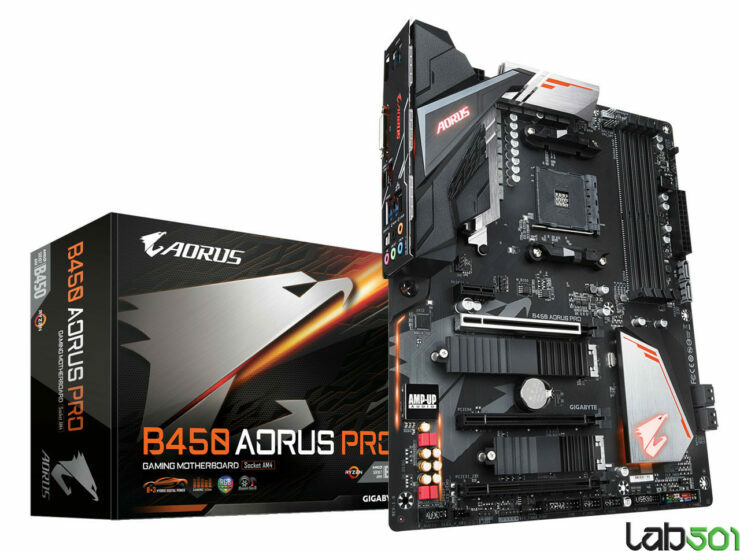 For the B450 Aorus M we have a similar power delivery with both of them being 11 phases, though exactly how they are mapped out and if they are using doublers or not is something not explained. unfortunately this board lacks the heatsink its larger cousin packs which could make overclocking an APU a bit of an issue. With the smaller size you remove one of the M.2 slots and are left with the M.2 22110 slot which auto switches between the second PCI-e 3.0 x16 slot while the rest of the storage connectivity remains the same. The audio seems to be a bit less beefy and packs a PS/2 combo port with LPT/COM Headers and we lose the USB 3.1 gen 2 type-C port. Pricing and availability have not been announced though we look forward to more information in the coming weeks.